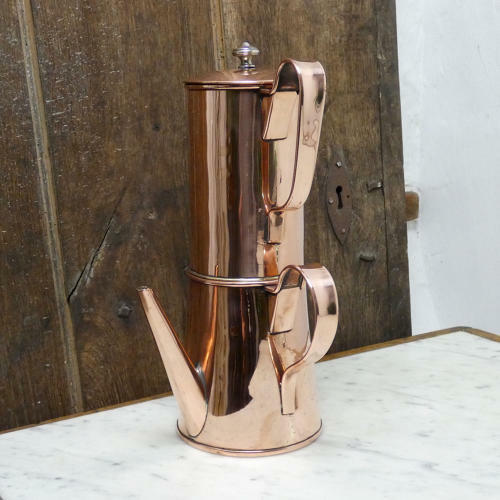 A very unusual, French copper coffee maker, probably dating from c.1890. This piece comprises two section and a lid. The lid could be used on both sections. There is a filter in the bottom of the top section and the coffee would have been put into this section and boiling water would have been poured over it. This would then gradually seep down, through the filter, into the lower section and the whole thing would have been kept on the heat.The lid could then be transferred to the lower section for serving. It is made from quite a substantial gauge of copper and it has castellated seams up the sides, under the handles. It is in excellent condition and the tinning, to the interior, is quite good, although there is a little rust to the steel filter.